For a fun alternative to traditional red rose delivery, send our stunning presentation box filled with a colourful mix of vibrant roses! This stunning gift features 18 fresh roses in a combination of hot pink, bright yellow and orange. Beautiful! 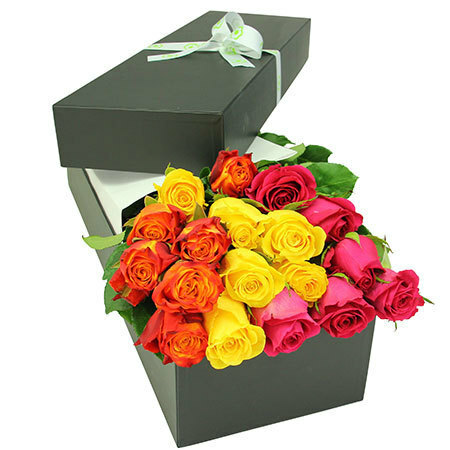 Spoil someone dear to you and organise roses delivered Sydney wide - we`re positive they will be tickled pink (yellow and orange!) when their gift box arrives! Here`s to rainbow rose inspired love! 2019-02-19 Service rating : The staff were extremely friendly and helpful when I contacted them via phone to change the date of delivery. The fee to change the date was also not unreasonable which I appreciated. The flowers were beautiful and healthy and my florist girlfriend really loved them. Product : Really beautiful layout. Reasonable price given it was for Valentine`s Day and the prices are automatically higher.